diffuse the categorisation of art, design and craft and foster an inter-disciplinary collaboration. Our collaboration in this exhibition represents a small number of encounters in a photographic studio and embodies the beginning of what we both hope will be many long fruitful future discoveries. 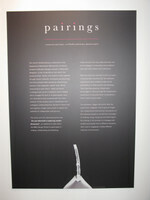 Pairings Exhibition, Special collections, Sir Kenneth Green Library, Manchester Metropolitan University.